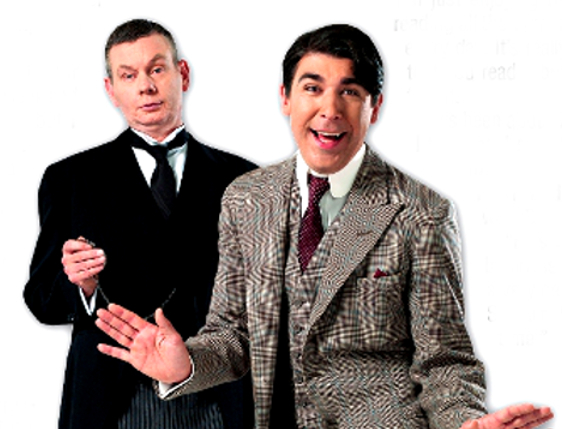 JAMES LANCE admits he hadn’t been on a theatre stage for years – but found the allure of playing iconic buffoon Bertie Wooster too tough to resist. He’s more used to TV roles, having appeared in I’m Alan Partridge, Teachers and The Book Group, but when he was offered the leading part in the PG Wodehouse classic, Perfect Nonsense, he didn’t have to think for too long. Playing the charmingly incompetent Wooster opposite Gregory’s Girl star John Gordon Sinclair as his unflappable valet Jeeves was a gift. “It’s an eccentric, creative character, beautifully written and there’s nothing I like more than making people laugh,” adds James, who also appeared in TV comedy Smack The Pony. He says the Jeeves and Wooster combination is a classic pairing. “The characters have endured because they’re an interesting relationship, they’re an odd couple and opposites attract. There are genuine differences so you’ve got a lot of potential misunderstanding and therefore drama. Of course Bertie has been played by a host of iconic actors on TV and film from David Niven and Ian Carmichael to Hugh Laurie, but James says he tries not to think about that. “I had my doubts because of that but once I’d accepted it I just thought I haven’t got to worry about how others played him,” he says. “I’m just enjoying the whole thing. I’m still reading all the Wodehouse books, I read a bit every day. It’s really fun to play a character that you read – but being back on stage is tough. It’s been about 70 per cent tougher than I thought. I said to John Gordon Sinclair ‘How much tougher do you think it is?’ and he said 70 per cent as well. But it’s really good fun. In Perfect Nonsense, a country house weekend takes a turn for the worse when Bertie is unwittingly called on to play matchmaker, but also to steal a silver cow creamer from Totleigh Towers. Naturally, the ever-dependable Jeeves is there to prevent Bertie from making a fool of himself in front of Wodehouse’s finest characters like Gussie Fink-Nottle, Madeline Bassett, Sir Watkin Bassett, Dahlia Travers, Roderick Spode and Constable Oates. PERFECT Nonsense will be running at Guildford’s Yvonne Arnaud Theatre from Wednesday (September 24) until Saturday, October 4.